Portable, powerful and versatile; the Rockville all-in-one PA system lets you take your music wherever you need to go. All In One PA System! So what does all-in-one really mean? 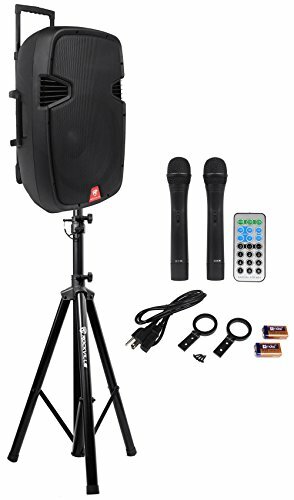 Speaker, Amplifier, 2 Channel Mixer, 5 Band Equalizer, Built in USB and SD Slots, Rechargable Battery, 2 Wireless VHF Mics, Built In Bluetooth. This is true all in one with nothing else needed to purchase! With a high quality rechargeable battery, compact light-weight design, and integrated carrying handles and wheels, you can easily pick up and go with your Rockville portable all in one system. RAM15BT: Amplified Pro Audio Speaker with Bluetooth Capability . 15" Amplified Portable Pro Audio Speaker. Power Ratings:. 800 Watts Peak Power. 400 Watts Program Power. 200 Watts RMS. Built-In USB (2.0)/SD/MMC/MP3 Inputs w/LCD Display. Built-In FM Radio Tuner. High Power Class A/B Amplifier. Blue Tooth Pairing from External Music Source. 5 Band Equalizer. AUX RCA Line In/RCA Line Out. 1 Mic Input (XLR). 1 Mic Input (1/4"). Wireless VHF Mic Capability with 2 Wireless VHF Mics Included. Built-In 12V-9AH Battery for Portability. Speaker can play for 4-8 hours per charge depending on volume level. Optional External Battery Connection for Extended Play Time. When you're looking for a quick sound reinforcement solution, you don't want to be bogged down with a bunch of cables, stands, and extra PA gear. The Rockville portable system is the system you want to have on hand. This all-in-one PA has everything you really need to be heard. You can plug in your guitar or keyboard, and even your MP3 player or BT music source and be up and running instantly.